Over the past two days, we’ve seen 25 startups (and 2 from the Startup Alley) launch on stage at our TechCrunch Disrupt conference in San Francisco. Our panel of experts questioned and voted on each. 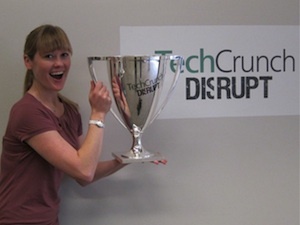 And now we’re down to the final seven in the race to accept the TechCrunch Disrupt Cup from Soluto, the winner of our last Disrupt conference last May. At 3:30 today the seven will take the stage to face our final group of judges: Roelof Botha, Ron Conway, Jason Goldman, and Marissa Mayer. There can be only one. We’d also like the take the opportunity to thank all the companies that participated in Disrupt this year either launching on stage or in the Startup Alley. It’s a huge cliche to say that “everyone wins” but we think time will prove that your participation here will ultimately pay-off. We expect big things from each of you.